Congratulations: You’ve survived the punk rock era of food. In the decade just past, we saw the demise of the entrée; instead, we’ve pieced together meals by sharing a slew of side dishes and small plates (tapas of every ilk!). We bid adieu to careful, precise service and, instead, bussed our own tables or poured our own water from jugs left on the table. Table linens disappeared, wine glasses were sometimes replaced by canning jars, “unsightly” soundproofing was pooh-poohed in favor of exposed ductwork and cement floors. And we embraced (well, OK, we resigned ourselves to) sitting at communal tables with strangers. If the chef wants to blast Rage Against the Machine through the dining-room speakers, who are we to complain? It’s not like we’re squares! Oh, but I am so tired. Eating in such a way can be exhausting. I admit that I get as caught up in what’s newest/coolest/hippest as the next impossible food obsessive. But isn’t it time for at least some of the restaurants to go back to treating diners like guests, creating environments where we might rejuvenate and converse without it feeling like work? A proper, well-cooked meal enjoyed at a leisurely pace in a lively, comfortable dining room is one of life’s finest pleasures—and such a meal can be had at Bainbridge Island’s Restaurant Marché. Sometimes it takes a veteran of the old school of fine dining to remind us of what we’ve so willingly given up. At the age of 52, chef Greg Atkinson finally opened his first restaurant, Marché, this March, and it’s a fine, stylish and mature restaurant in a midcentury modern building he had completely redone just off the main drag in Winslow. Sometimes it takes a veteran of the old school of fine dining to remind us of what we’ve so willingly given up. Marché is the culmination of decades of knowledge and experience, from the Friday Harbor House in the ’80s, where Atkinson was one of the earliest chefs to work directly with farmers to create his menus, to Canlis in the mid-’90s, where he revolutionized the menu during his seven years as chef, bringing seasonality and modernity to the legendary chophouse. 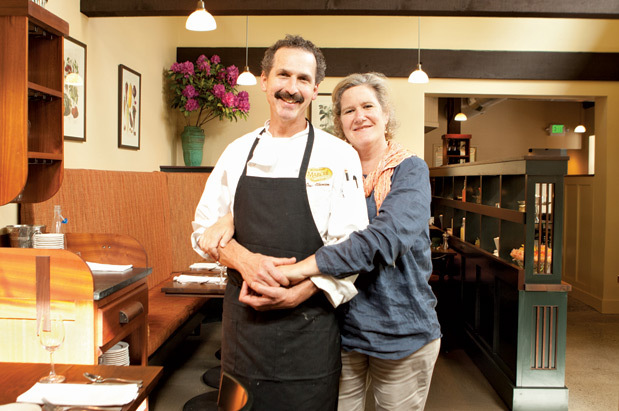 He’s since spent years teaching at the Seattle Culinary Academy, penning a column for the Seattle Times’ Pacific Northwest Sunday magazine, consulting for restaurants, writing six cookbooks and, as a Bainbridge resident, he occasionally popped in to help out at the lauded Four Swallows, just down the street from Marché, when the chef there needed a respite. Now, as he stands over the blazing wood-fired grill in the open kitchen of Marché, masterfully searing Skagit River steaks and nudging fresh local salmon to a lush finish, Atkinson’s confidence and skill are apparent. You can watch from a comfortable banquette, upholstered in a tweedy fabric the color of a terra cotta pot, or opt to sit on the sunny patio sipping a chilled glass of rosé. The building has been fitted into a series of smaller, snug spaces, with floor-to-ceiling windows, and there’s not a bad seat in the house. And then, dinner arrives. Perhaps it’s the trout meunière ($18), a quiet dish of subtle pleasures that relies heavily on the chef’s technique. The browned butter, the silken fish that easily slides away from the skin, the shot of lemon to balance the richness while not shouting down the other flavors. But just as delicious: the potato gratin cooked to a nutty brown crust, served beneath the trout. And sautéed greens, too. Could it be that Atkinson’s Marché will herald a return to the formal dinner plate: carefully considered textures and deliciously prepared side elements thoughtfully chosen to complement the star (steak, salmon) of the dish? The trout is a good argument in favor of this; it’s a thoughtful and balanced plate of food. No side dishes necessary. Don’t get me started on the fries. OK, get me started on the fries. They are the absolute best I’ve ever had: skin on, fried to a deep gold, creamy on the inside. They come alongside the sensational steak—there is just something marvelous about grass-fed steak cooked over a blazing wood fire—and it’s easily the best steak frites ($21/$26) I’ve had in a long time. 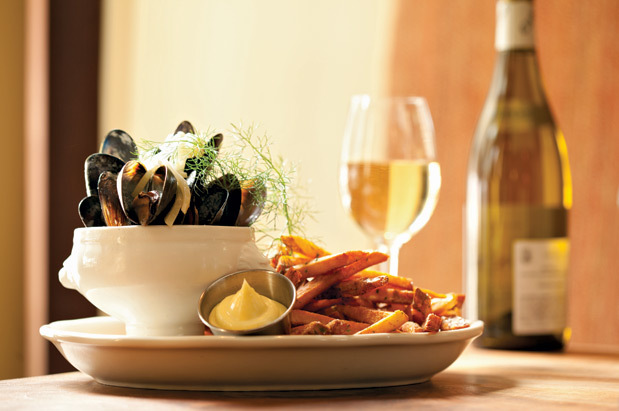 The terrific fries can also be enjoyed dipped into the fennel cream with Pernod, which serves as the steaming liquid for a bowl of plump local mussels ($15; shown above). 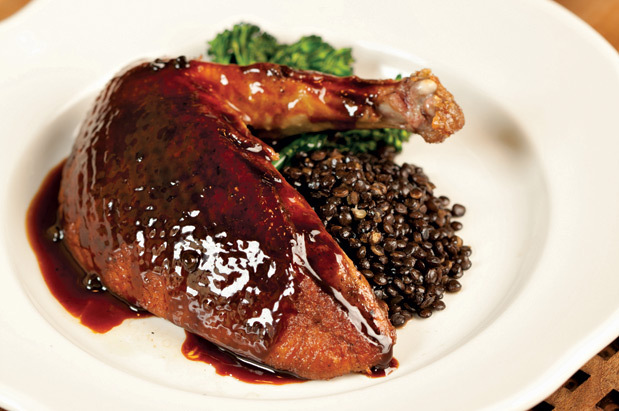 There’s a throwback appeal to the menu; Atkinson, one can tell, doesn’t feel the need to change the menu every day or even every month, and I find it comforting that the crisp-skinned duck breast laid over Puy lentils ($24; shown above) dressed in a buttery brandy sauce will likely be there when I return. As will the crudité salad ($8), perfectly fresh vegetables served with a pickle-flecked rémoulade; actually, all of the exuberantly fresh salads are quite remarkable here. This is the menu of a chef who knows what he likes to eat, knows what he likes to cook, knows which farms grow the best produce and which fishermen bring in the freshest catch. And he also knows that keeping price points in such a reasonable range—from the high teens to the mid-$20s—makes Marché an any-night destination. Atkinson has been at it for decades, and it really shows. On one of these fleeting summer evenings, I urge you to park your car on the Seattle side, walk onto the ferry for the sensational 30-minute ride across Elliott Bay, and then walk the short distance (or cab it if you must, for about $5) to the restaurant. There, you’ll likely be greeted by Betsy Atkinson, Greg’s wife, who, even though we’d never met (and I dine anonymously), proudly said that that was her husband in the open kitchen cooking our dinner. She then mentioned that she and Greg had been married 26 years. And so, while it’s hard to put your finger on just what makes for the small-town appeal or the genuine warmth in the air at Marché (even if the eager service can sometimes feel overly rushed), watching a husband-and-wife team run their first restaurant after raising a family together, and tasting the food of a chef whose classic training elevates even the most traditional of plates, it’s a welcome break from the current trend in dining. It’s all so clearly not punk rock that I happily realized: What’s old is new again.